This cocktail table has a tabletop width of 30" and stands 42" tall. Full length tablecloth would be a 120" round. 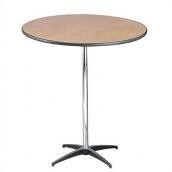 30" Round Standing Cocktail Table Rental. This table seats 2 to 4 people.